Hear me out. What if the ancient Mayan deities were really giant alien robots, competing in a series of deathmatches broadcast across the galaxy? I know what you're going to say, but it makes about as much sense as anything on Ancient Aliens. It also happens to be the premise of the new game Mayan Death Robots. Inspired by classics like Scorched Earth and Worms, MDR is chaotic and entertaining, but with chaos is not without its consequences. 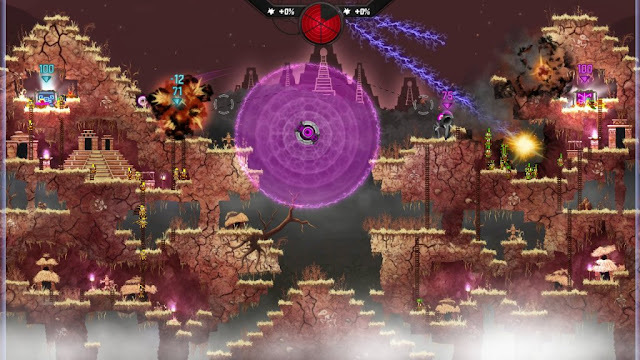 Each round of Mayan Death Robots throws two players into one of several different environments as each tries to destroy the other player's core. 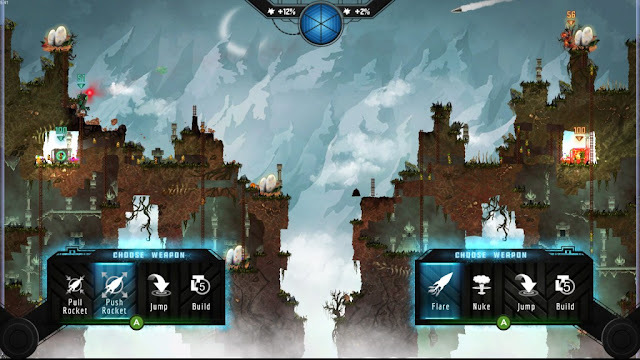 The eight robots in the game each have two unique attacks, so it's important to choose the right robot for the environment you'll be fighting in. Some are poorly equipped for certain environments and it can be frustrating to realize you've chosen a robot with air strike like weapons in an underground arena. Instead of the standard turn-based play familiar to any Worms fan, MDR uses a timer to execute turns simultaneously. In just a few seconds, each player has to find and choose the best weapon and aim it before time runs out. Aside from weapons, each player can build new terrain in Tetris like sections. Few things are more frustrating than carefully aiming your shot only to have it blocked by a huge chunk of earth. One thing I always loved about Worms were the numerous strange weapons. MDR has quite a selection as well, and while I mentioned already that most are exclusive to one robot or another, there are occasional drops of other weapons into a match, livening things up a bit. More weapons are unlocked through the campaign, adding more chances for devastating new weapons to appear. Where Worms is built for a longer game with careful, calculated shots, Mayan Death Robots captures the frenetic pace of reality game show. The countdown and simultaneous turns keep things moving steadily, especially for indecisive player for whom choosing a weapon is a time consuming process. While you can aim your shot right up until the last moment, once you've chosen what you're firing it is locked in no mater what. More than once, I've selected my most powerful weapon, only to have it backfire when the other player plunked down a huge piece of terrain right in front of me. I enjoyed my time as a hulking death machine, but there are numerous aspects I would change. The arenas in MDR feel cramped, which could have been intentional, forcing players into each other instead of allowing them to distance themselves and play more defensively. Many weapons are very similar in their behavior, so while there is a large number of weapons, the real number is somewhat lessened by their similarity. Mayan Death Robots is a fresh take on a somewhat stale genre. From the gameshow-esque atmosphere, to the large bosses that appear from time to time, there is a lot of entertaining content to enjoy. Unfortunately it is tempered somewhat by a few shortcomings. While I can't see this game replacing Worms by any measure, but it has earned a place alongside it in my library.